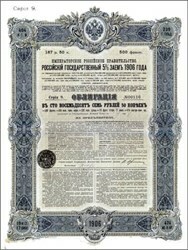 Beautifully engraved Certificate from the Imperial Russian Government issued in 1906. This historic document has an ornate border around it with a vignette of the Romanov seal. This item is hand signed and is over 111 years old. Some signs of wear. The face of the bond is written in Russian and the verso is written in English, French and German.